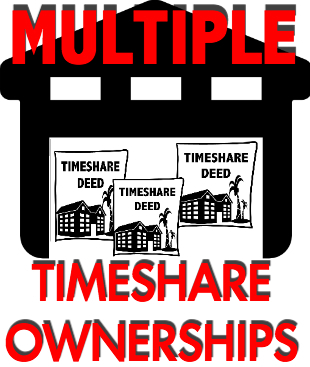 Multiple Timeshares: You May Own More Than One Timeshare and Not Even Know It! Do you own multiple timeshares? No? Are you absolutely sure about that? Some timeshare owners agree to “upgrade” their ownership in order to receive the latest benefits offered by the resort to new owners or broaden their travel options, thinking that it is simply an “improvement” of their current plan. Later on, they (or their heirs) find out that in reality, they actually own multiple timeshares with multiple timeshare deeds. If you’ve ever called your resort complaining about not being able to get the week or destination you were promised, you likely were told that the reason you can’t get what you want is because you have a “low level” membership, don’t have enough points, etc. The resort will then almost always try to up-sell you on the latest, greatest “Platinum membership” or necessary points upgrade. Those timeshare owners who don’t know better won’t even ask if there is an additional deed involved. Those who do ask will likely be pacified with circular logic or promises to eradicate their previous ownership in the upgrade process. As years pass and upgrades are purchased, you as an owner could end up with as many as 7 or more deeded timeshare ownerships! There are even cases where the resorts will coerce timeshare owners into purchasing multiple timeshares by promising that if the owner buys a higher level membership, the previous membership will be cancelled or “absorbed” into the new membership. When this promise is conveniently ignored by the resort administration, the owner is stuck with multiple timeshares…usually without even knowing it! You may be saying to yourself, “I know I don’t have multiple timeshares. The resort told me the old timeshare was automatically canceled by the new membership level.” You may even get the run-around if you call your resort and directly ask them how many timeshares you own. How Do I Know if I Have Multiple Timeshares? You’ve owned your timeshare for many years, attended owners’ meetings and signed new papers. You now have thousands of more points than when you first bought into your timeshare. You own more than one week, especially non-consecutive weeks. Your maintenance fee bill shows more than one contract number. You own multiple weeks with the same resort but at different locations. Timeshare ownership levels, memberships, points and programs can be very confusing. Considering that your confusion is used against you when timeshare salespeople are convincing you to sign on the dotted line, looking to the resort to explain things in a way you can actually understand can be a frustrating waste of time. In fact, most people who end up buying timeshares do so as a result of this purposefully complicated system being presented in unrealistic yet enticing ways. Your confusion and/or lack of thorough understanding is the resort’s best sales tool. Multiple week timeshares are timeshare ownership plans where the owners are entitled to using the resort for more than one week per year. These may or may not be separately deeded timeshares. Multiple destination timeshares differ from multiple timeshare ownerships in that you may have one ownership that allows you to vacation at different (multiple) destinations. Timeshares with multiple locations are preferable for those who do not want to be forced to vacation in the same resort every year. These also may be separately deeded timeshare ownerships. Multiple timeshare ownership refers to actually having multiple deeds. You likely have multiple ownerships if you receive separate bills for your maintenance fees, originating from different companies. A few of the most common billing companies used by timeshare resorts include Advanced Financial Company (FinCo), All Point Solutions and Resort Funding, LLC. As well, if you attended an “owners meeting” and were talked into buying additional points, you may actually be buying new timeshares every time you upgrade your points package. So, is it detrimental or beneficial to have more than one deeded timeshare ownership? Does it even matter? It is important to know if you have more than one deed, as you may be liable for multiple special assessments in the case of weather damage or other catastrophic event. Also, the fees to get out of your timeshares will be multiplied by the number of deeds you have. How do you find out for sure if you have multiple timeshares? Contact the timeshare experts at Redemption and Release, LLC for a FREE, NO-OBLIGATION TIMESHARE TITLE SEARCH! DO YOU QUALIFY FOR OUR MULTIPLE TIMESHARE DISCOUNT?Click Here to Find Out Now!